Diocese of Parramatta World Youth Day 2019 pilgrims were treated to a day encountering some of the rich history of Mexico visiting the Pyramids at Teotihuacan near Mexico City in the morning, before unwinding with time for prayer and fellowship in the afternoon. The Diocese of Parramatta pilgrims said goodbye to Puebla and travelled by bus for two hours to the UNESCO World Heritage listed city of Teotihuacan. Pilgrims embraced the opportunity to climb the 248 steps of the Pyramid of Sun and look upon the avenue of the dead and Pyramid of the Moon. Teotihuacan is thought to have been established 100BC and became a religious centre in the first century AD. During its peak, it is said to have had 125,00 inhabitants. After the climbing, it was again on the buses to the afternoon’s activities. Diocese of Parramatta pilgrims climbing the pyramids at Teotihuacan. Image: Diocese of Parramatta. Significant amount of time travelling on buses has been punctuated with morning prayer of the church, daily Rosary, Angelus, reflections, singing and the building of friendships – it also has been a time of much-needed sleep from the hectic and exhaustive schedule in Mexico. Following the visit, the pilgrimage group travelled two hours across Mexico City and were welcomed at the seminary of the Misioneros de Guadalupe (Guadalupe Missionaries, MG) in Tlalpan. At the seminary, pilgrims were greeted by the MG Seminarians with a typical Mexican lunch of tacos and a lively presentation of the work of the Guadalupe Missionaries. Established in 1949, the Guadalupe Missionaries bring the “good news” to countries that would not ordinarily have had the opportunity to have heard the Gospel. Following the presentation, pilgrims were given the opportunity to spend time in their small groups and participated in recreational activities. The day was ended with Mass celebrated by Bishop Vincent in the seminary chapel, with the homily preached by Fr Fernando Montano, Parish Priest of St Bernadette’s Parish, Castle Hill. Fr Fernando explained how this chapel was a significant part of his life as a priest, being the location of his first Mass. Fr Fernando was ordained an priest for the Guadalupe Missionaries before relocating to Australia where he was incardinated into the Diocese of Parramatta. Fr Fernando in front of ‘Dios padre y crucifixión’ painted by Federico Cantu. Image: Diocese of Parramatta. The Diocese of Parramatta will be a hosting a special World Youth Day event on January 27. 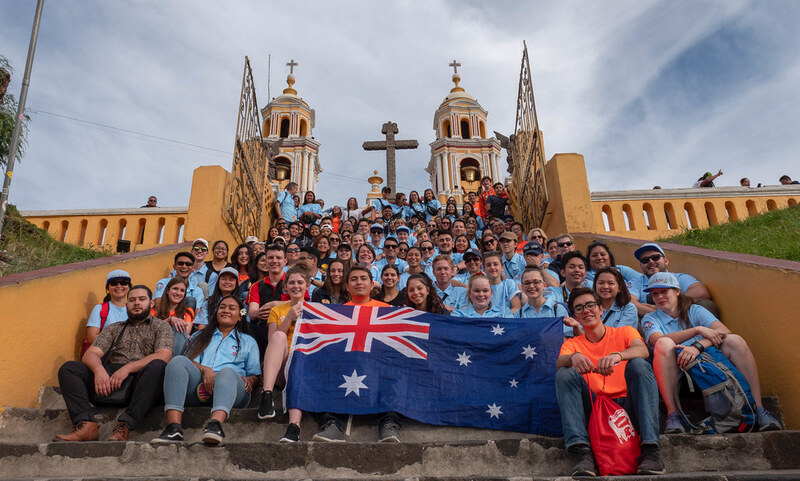 As the 171 pilgrims from the Diocese of Parramatta prepare for the final Mass at World Youth Day 2019 in Panama, their families and friends are being invited to celebrate alongside them thousands of kilometres away in Parramatta. The World Youth Day (WYD) 2019 IN-Sync event on Sunday 27 January will allow those families and friends to connect with the pilgrims as they finish their pilgrimage. WYD2019 IN-Sync has been organised by Catholic Youth Parramatta, Institute for Mission, St Patrick’s Cathedral Community and the Diocesan WYD Steering Committee. The World Youth Day 2019 IN-Sync event will be held at St Patrick’s Cathedral, Parramatta, on Sunday 27 January at 6pm. The IN-Sync event will begin with Mass at 6pm at St Patrick’s Cathedral, Parramatta, with a celebration of food, music and fellowship to follow.